JazzInk: Sound Check: Will You Still Hear Me Tomorrow? There was a blowout tonight at the Icehouse. Unfortunately it was ear drums that were most at risk. 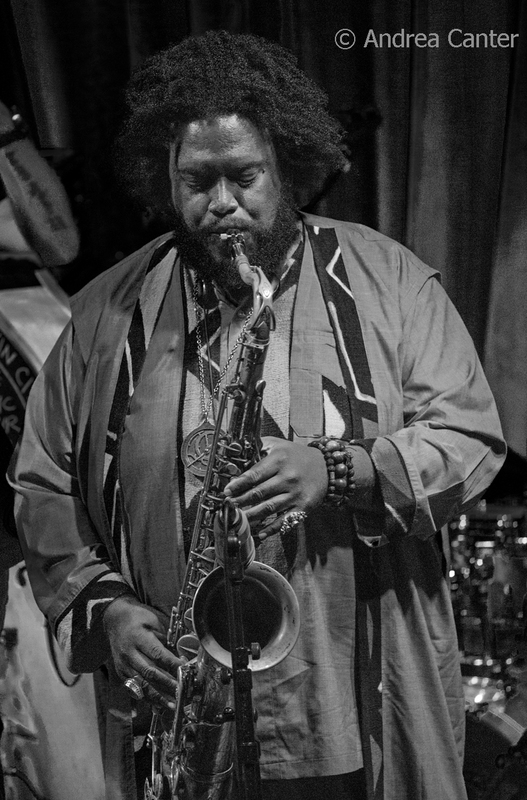 I knew very little of saxophonist Kamasi Washington before I saw the promo on the Icehouse website for his "Dectet" gig. I'd skimmed an article in the June issue of Jazz Times. And I checked out his music online. Most recently he has toured and recorded with a ten-piece band, and the original music seemed at least interesting in combining hip hop and rock beats with improvisation and an orchestral feel. The gig sold out despite the $22 ticket price, on the high end for Icehouse shows. Tim Berne, somewhat of an icon among avant garde jazz fans, sold out the Icehouse a few months ago for half that price. I counted myself lucky to snag a ticket (and a table) until the first blasts of the sound check. Then I realized I was in over my head, or rather over my ears. The space quickly filled with mostly standing Gen Xers and Millenials -- tables and chairs on the main floor had been cleared to allow for a larger, if less comfortable, audience. 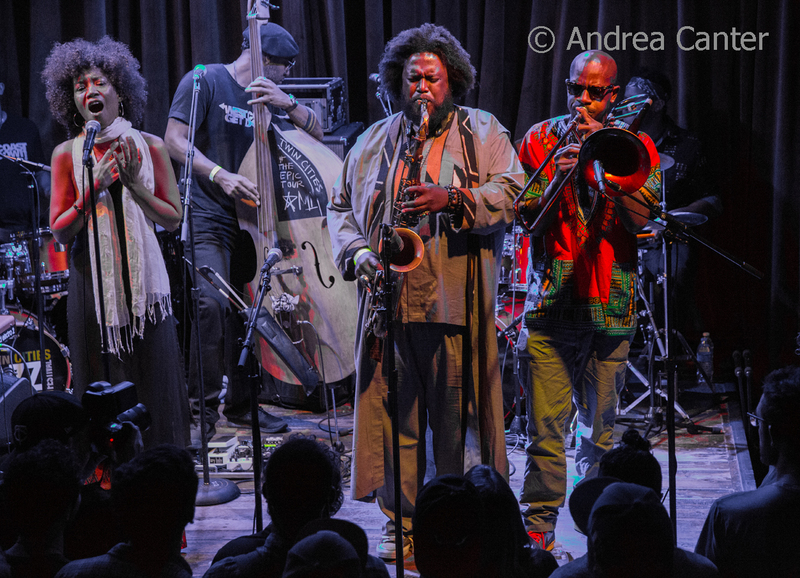 Kamasi Washington already had an eager following in the Twin Cities. A few younger people hovered outside in front of the window, either hoping for tickets or enough sound to provide free audio. They surely benefitted from the latter. 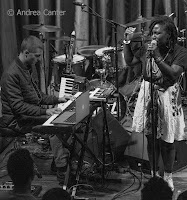 Javi Santiago, Miguel Hurtado and Taylor Johnson, aka Murkury, joined New York vocalist Tamara Renee for a short opening set of a cool blend of jazz, soul and R&B, albeit at a greater volume than I've ever heard from Javi and Miguel. That was just a warning. 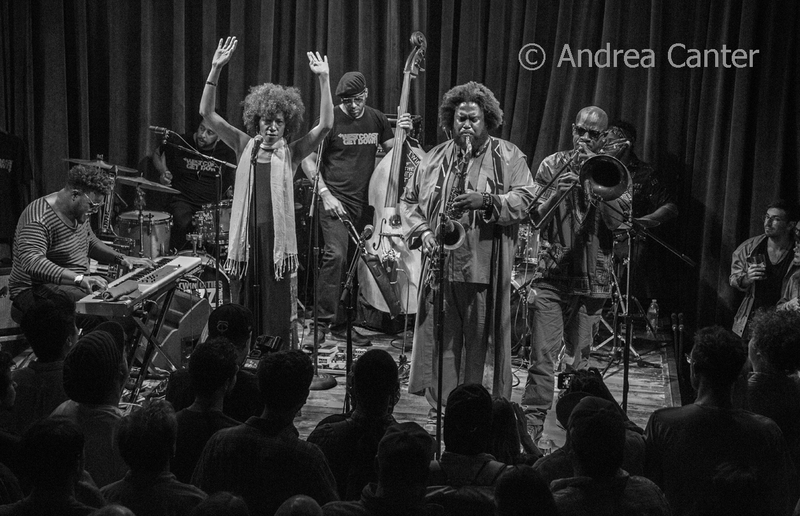 Kamasi Washington and company wasted no time proving my ear plugs were close to useless. Well, perhaps I would have passed out without them. It occurs to me that too few people complain about outrageous volume levels. Loud is equated with excitement and excitement is the most addictive "drug" of the 21st century. Most of this audience at the Icehouse came of age under the sign of Loud. I came of age under the sign of rock 'n roll -- what our parents considered Loud, but easily averaging about 50 decibels below the typical rock concert of 2015. Now I sound like my parents. But they were right about this. What is not "relative" to time and place and musical taste is volume and its impact on human ears, which are not evolving to handle more and more decibels. Rather, those little hairs in your ears (stereocilia) are merely shrinking and disappearing along with the ability to distinguish and ultimately receive sound. My dad at 94 has precious few of those little hairs left and he never listened to loud music intentionally. The finest digital hearing aids can't reconstruct sounds that never reach the eardrum for lack of stereocilia. My 60-something peers who insisted on turning up the volume in their teens now may be approaching the hearing acuity of 90-somethings. What about the Millenials? What sounds will they hear in their 60s? Or 50s? And how exciting will that be? Then there's the phenomenon of sound checks. It seems that the volume for drums and bass are established as the baseline for whatever band. Then the brass and piano have to be set high enough to be heard over drum and bass. Why not reverse the process and set piano and saxophone (and voice) at a reasonable level and let the drums and bass come down to meet them? But I digress from this evening's event. With ear plugs, I only survived through the first three tunes (and I use the term loosely) of Washington and the Dectet. That was more than enough as I wanted to save my hearing at least long enough to enjoy Ron Carter and Bill Carrothers this weekend. 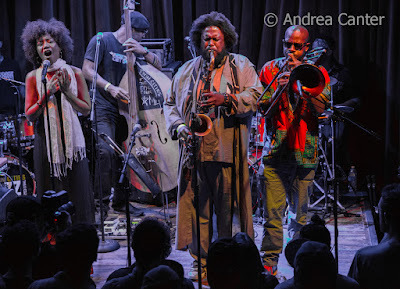 And frankly I was unable to draw any real conclusions as to the talent of Kamasi Washington and his bandmates. One consequence of extreme volume is that it disguises talent as easily as lack of talent. As long as your drummers (Washington uses two) and bassist can effectively maintain a halfway interesting rhythm, you don't need much else as you won't hear much else, or what you do hear from horns etc. is so distorted that it is impossible evaluate. A weak saxophonist can hold his or her own and get away with it. And a strong saxophonist, which I suspect Washington really is, gets lost in the invasive auditory muck that obscures whatever talent. Does the audience care? Apparently not. After all, Loud = Excitement, and Excitement trumps all. 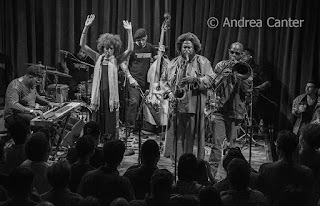 I actually might enjoy Kamasi Washington's new 3-disc release, Epoch, at least when I am in charge of the volume (and bass) settings. These musicians deserve much better than what they are giving themselves--sonic disguise. Get rid of the distortion, the excess vibration, the inevitable bleeding of sounds (as opposed to true harmony) and I bet we uncover an ensemble of talented musicians with distinct voices and inventive musical ideas. I just wish we could actually hear the music! It's hard to keep your ears wide open when your stereocilia are screaming for insulation.